Italian painter. He was born in the medieval hill-town of Sermoneta, south of Rome, and his career and fortunes were shaped by the life-long patronage he received from the Lords of Sermoneta, the Caetani Family. After a possible apprenticeship with Leonardo Grazia da Pistoia (1502-?1548), he became an assistant to Perino del Vaga, himself one of Raphael s pupils. 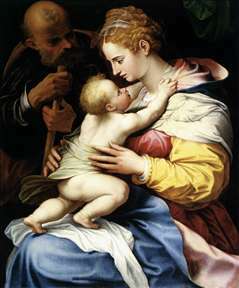 His earliest dated work is an altarpiece of the Virgin and Child with SS Peter, Stephen and John the Baptist (1541; Sermoneta, Castello Caetani), commissioned by Camillo Caetani (1495-1554) for SS Stefano e Pietro, Valvisciolo. It is an immature work, derived from Leonardo Grazia and Perino and also reminiscent of late 15th-century compositions by Pietro Perugino. The figures are bulky, stiffly posed and crowded together. Their heavy drapery fits loosely about their bodies, and their faces have delicate features like figures by Leonardo Grazia and Perino. The most striking aspect of the painting is the powerful colour combination of citric orange, blue-grey, blue-green, golden yellow and salmon pink. Commissions in Piacenza (1545-46) and Bologna (1545-48) preceded his return to Rome, where he would paint a succession of prominent altarpieces and fresco cycles from the 1550s until his death in 1575. The artist s style underwent noteworthy changes in these years. From the fluent undulating forms of his early works Siciolante turned to more elaborate and elegant mannerist devices, as seen in the frescoes and altarpieces he executed in Emilia (such as, the Holy Family with Michael in the Pinacoteca, Parma). These in turn came to be modified by a monumentality in representation and a clarity in composition that seems to have been inspired by Michelangelo. Siciolante s mature works are characterized by figures that are powerfully conceived yet restrained in movement, elegant in attitude but ultimately earthly. His mannerist extravagances were tempered by classicizing tendencies, notable as well in his rigorous preparatory drawings. This unique style, complemented by ordered compositional devices and a brilliant palette, found an enthusiastic audience in Counter-Reformatory Rome.